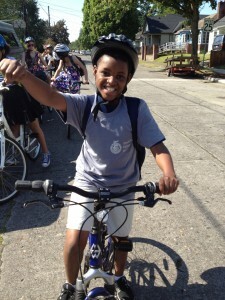 This summer, Ubong, an 11 year old boy, earned a bicycle through our Bike Camp at Faubion Elementary School. This was not just any bicycle; Ubong earned a means for independence in the shape of a blue bike with red flames. As soon as he met his new bike, they became inseparable. Ubong—along with 12 other kids whose families have a low income—participated in the Bike Camp in partnership with Faubion, sponsored by the Timbers Community Foundation and Russell Street Bar-B-Que. The group spent the week riding to fun destinations, including Cathedral Park, and they even got a chance to visit Russell Street Bar-B-Que for some lemonade on a hot day. Throughout the week, students learned how to properly maintain their bicycles and ride on the road safely. Ubong, the most enthusiastic camper, devoured all knowledge available concerning either riding protocol or bicycle maintenance. He understood that the information would help him take the best possible care of his bike after taking it home on Friday. He treated his bike with respect, never leaving it unattended, and he rode it as much as time would allow it. Paying special attention to each small detail early in the week, he quickly became a leader in the group mechanical work and bike safety checks. Ubong was uncertain how much he would be able to ride once he brought his bike home. Like any concerned parent, his mom wanted to ensure that he was able to ride his bike safely before he could ride independently. 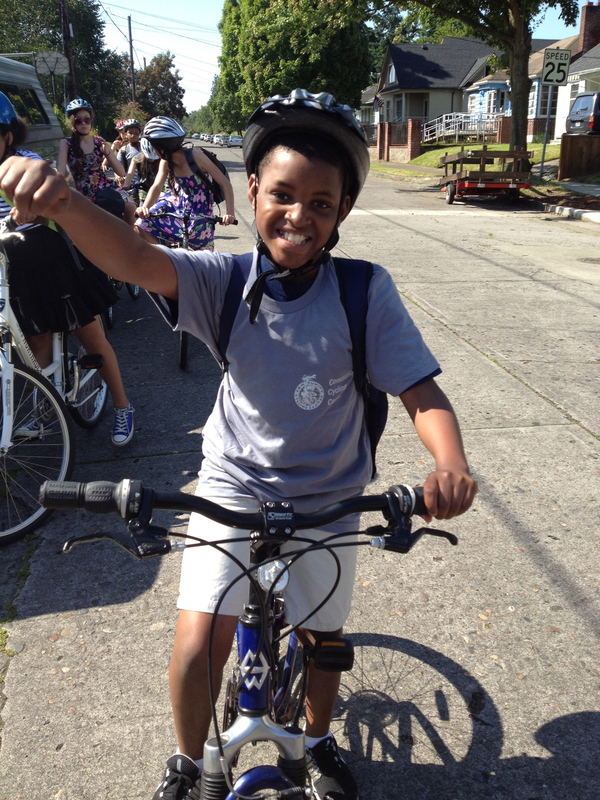 Excited to prove his skills, Ubong’s focus turned toward learning the proper hand signals and riding protocol during Bike Camp. He paid special attention to the intersections where it is safer to cross as a pedestrian and learned how to map out the best routes. His hard work paid off in the end when he was confident in his ability to care for his bike and ride safely. On Friday, Ubong earned more than just a bike, he earned the ability to get around his neighborhood independently.